Meeting up with new friends is always exciting. Last Saturday, a friend and I decided to hang out and while I narrowed the choices, he ultimately picked this microbrewery. We drove down and I was a little concerned about parking, as Ossington seemed to be where everyone hangs out on a Saturday night. Driving down the street I was immediately drawn to every single one of their restaurants, bars, and late-night shops. It reminded me of Montreal and I really needed it, as I’ve been missing the hipster Montreal for a while now. After securing a parking space, we walked over and there were (luckily) only a small group ahead of us. We were seated within 10 minutes of arriving and were situated at a cute table on the outside edge of the patio. The temperature and amount of breeze was perfect. The only downside of sitting at this location was the Ossington bus dropping passengers off right in front of us every 10 minutes, emitting putrid amounts of pollution. The brewpub had the juxtaposition of slightly grungy industrial feel, with the romantic lights overhead and the white picket fencing around the outside. The place was busy but not rowdy, filled with interesting conversations and kept the mood light. It’s an incredible atmosphere that just brightens up your attitude about the harsh realities of the world, giving you positivity that you might have needed. Obviously, we ordered beer, as Bellwoods is a microbrewery. I ordered the Gotham beer and he ordered the Wizard Wolf. I normally don’t go for dark beers, but have to admit; I only ordered the Gotham because I’ve been obsessed with the Batman: Arkham City game recently, and I just couldn’t resist. Gotham was described as “Complex, bold aromatics of citrus rind and dark berries, lingering bitterness of orange pith, pine resin and dark cocoa.” The beer was quite bitter, but not very hoppy. There was a prominent but not overpowering flavour of citrus and berries. There was also the slight hint of earthiness from the cocoa. I was pleasantly surprised by how much I liked it. For food, we ordered the Meat Board and the Smoked Fishcake. 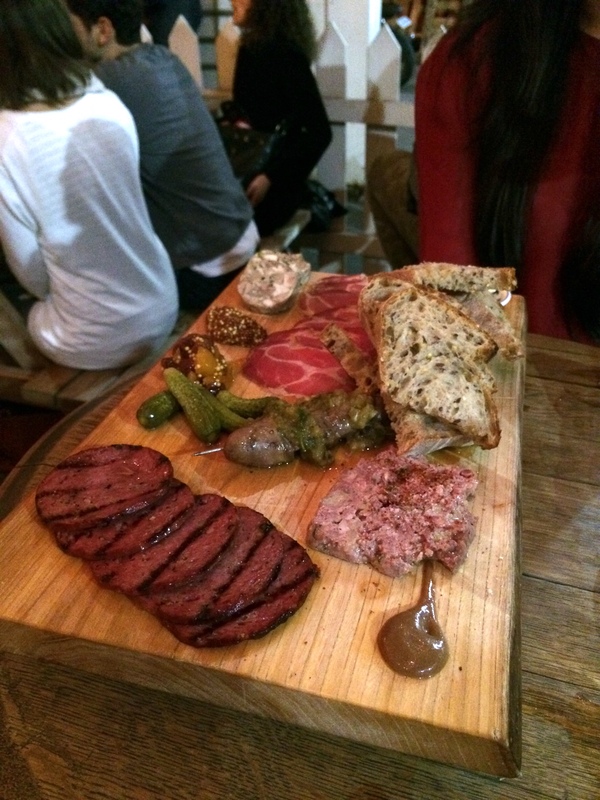 The Meat Board featured a variety of salumi, sausage, terrine, other sauces, and bread. It also came with a large scoop of lard which I did not touch. 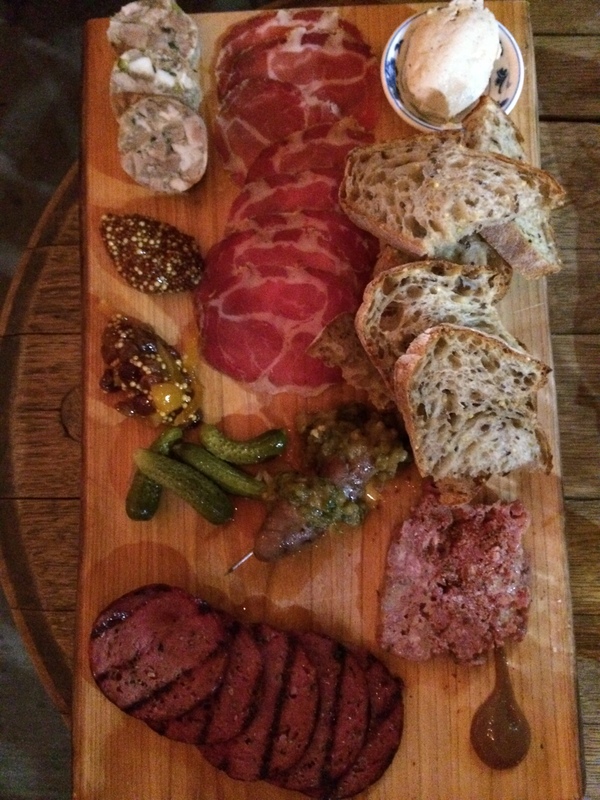 I thought the pickles and the mustard seeds were an excellent contrast to the saltiness of the meats. My favourite of all the meats was probably the capicola. The smoked fishcake was served with some cream aioli as well as a whole bone with marrow inside. I’m not a huge fan of bone marrow, so I only had a small taste of it. It was as slimy and unpleasant-feeling as usual, but a little saltier than the last time I’d had it. The fish cakes were quite moist on the inside with the smokey fried flavour on the outside. I couldn’t tell what fish it was, but there was not a lot of fish flavour, and in my opinion, there was almost no flavour other than the smokiness and the taste of “some sort of meat”. The cream aioli didn’t do anything for the fish cakes either, so as a whole, this dish was quite disappointing to me. 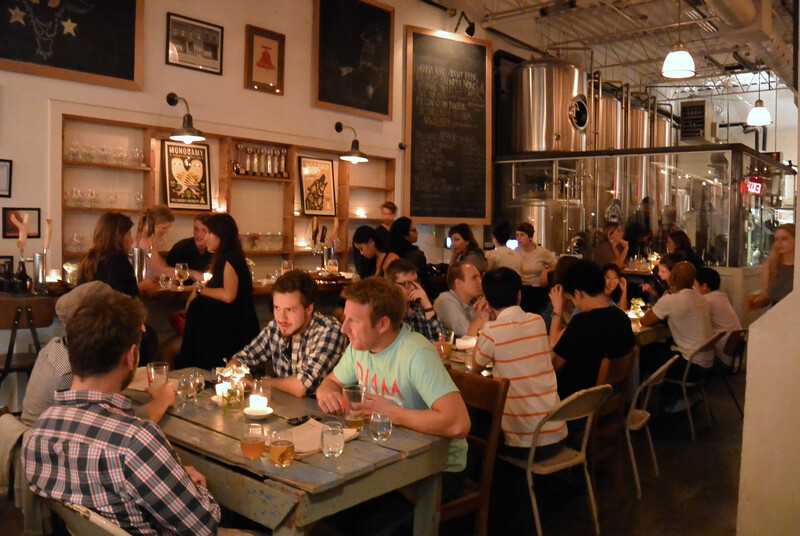 Overall, Bellwoods Brewery is an amazing place for some R&R with close friends or loved ones. The beer selection they have is interesting and refreshing. The decor is absolutely at the peak of what I call casual perfection. The food is a little disappointing, but in terms of having some snacks, they are definitely better than the usual fries and wings combination. 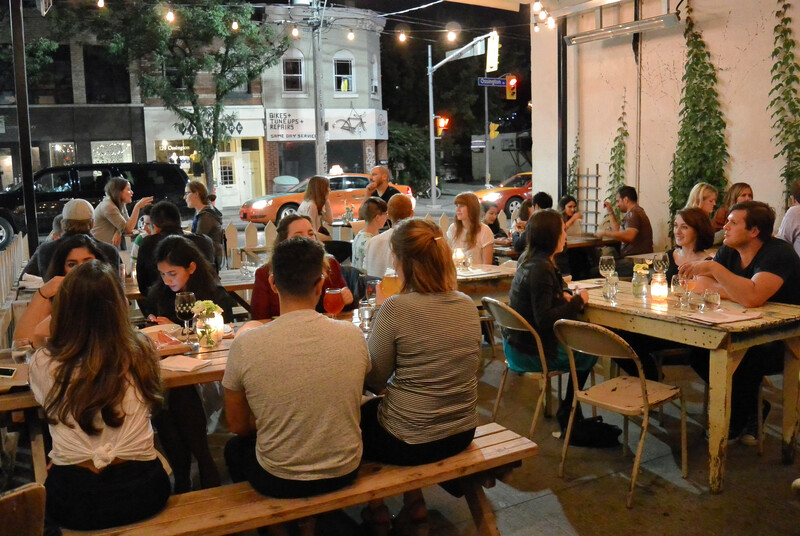 Definitely hit up Bellwoods for the night, as all along Ossington there are many other exciting restaurants that may peak your interest as well! Price: $30 with food, $15 for beer and snack. Next Next post: Start of the young foodie revolution?